If you are in the United States, how do you celebrate Memorial Day (weekend)? 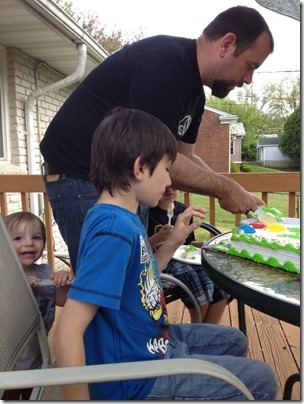 Because our first grandson, Jacob, was born on May 28th, we generally get the family together and have a barbeque sometime over the holiday weekend. We did that yesterday. It was a beautiful day, warm, sunny, and perfect for grilling out. Son Sean is the grill master when we visit them, and a good one at that! Delicious pulled pork sandwiches, baked beans ala Margaret, fresh fruit, birthday cake and more munchies than a body should eat. Usually, there are more people around the table… but Kim and Samantha had a stomach bug, so they stayed in the bedroom and tried to feel better. Staying in the bedroom kept everyone else from catching what they had, as well. But we hadn’t seen Loren and Margaret since Christmas, so it was nice to hang out with them. I spent some time over the weekend finishing my class sample for my hand quilting class. I wasn’t sure what color binding to put on it, so I opted for a two-color version. Yellow, like the front of the quilt, and a thin flange in a light grey. 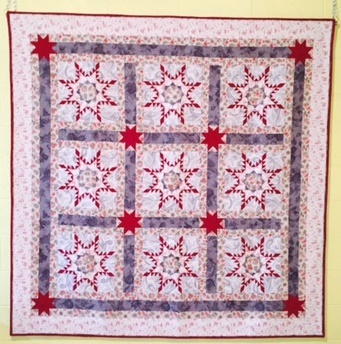 The quilt was hand quilted with light grey thread as well. I just wasn’t in the mood for an all yellow quilt, so the touch of grey seemed to be the right thing at the time. It’s just a little piece, but a good size for a beginning student. I’m not at all happy with the way the binding looks… that may be redone soon. Too much puckering on the edge of the quilt for my liking. UGH. Someone had told me that it was a lot of quilting to do for a first time quilter. Could be, but the cross hatches can be omitted if desired. After the class, I will be adding trapunto to the piece, which will give it a different look. « Contrary to what you may have thought, I have NOT fallen off the planet! I think your sample is beautiful, Caron. I would love to be a student in your class. You have such faith in that I will be able to make one like that. Wish you good luck with your teaching. PS! I am teaching my first workshop in handquilting at my LQS tonight. we never have gotten into doing anything much for the long weekend, most of our family lives over 2 hours from us and our children aren't here either. We usually do a lot of yard work and stuff around the house. Yes people with stomach bugs need to stay home! no need to pass it to others.